Gallery of gorgeous living room chandelier ideas including traditional, contemporary and modern designs. 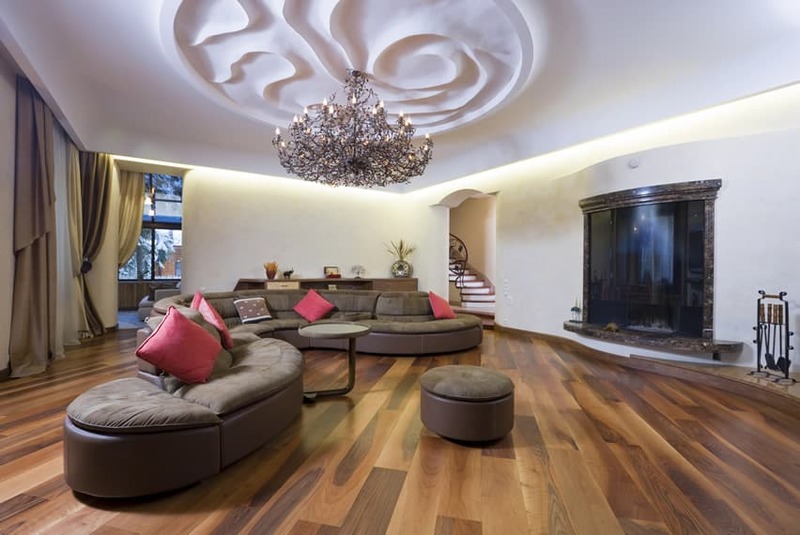 Lighting is an integral part of residential interior design. This is especially true for living rooms which serve essentially as the proverbial front of the house. 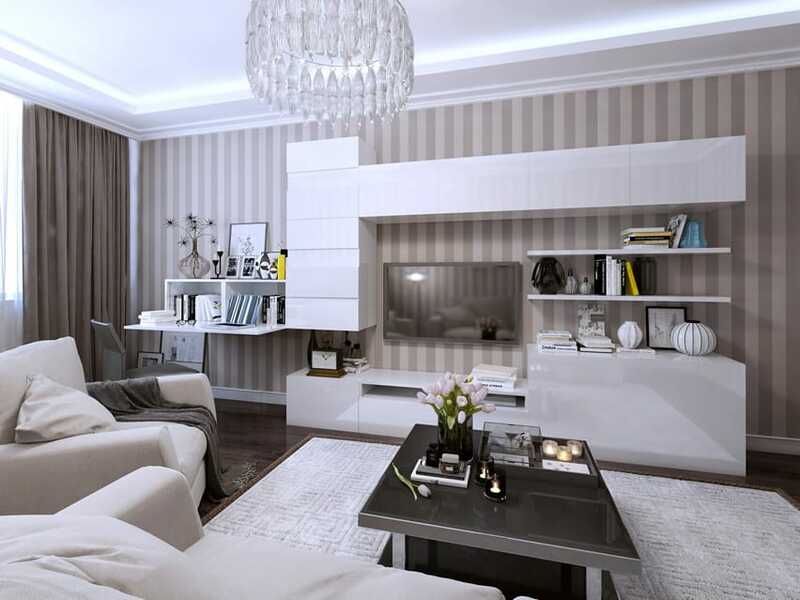 Functionally, the lighting design must be able to give sufficient visibility in a space and aesthetically, it has to enhance the overall look and feel of the living room. We’ll be taking a quick look at a type of lighting fixture we’ve covered quite a few times before – the chandelier. 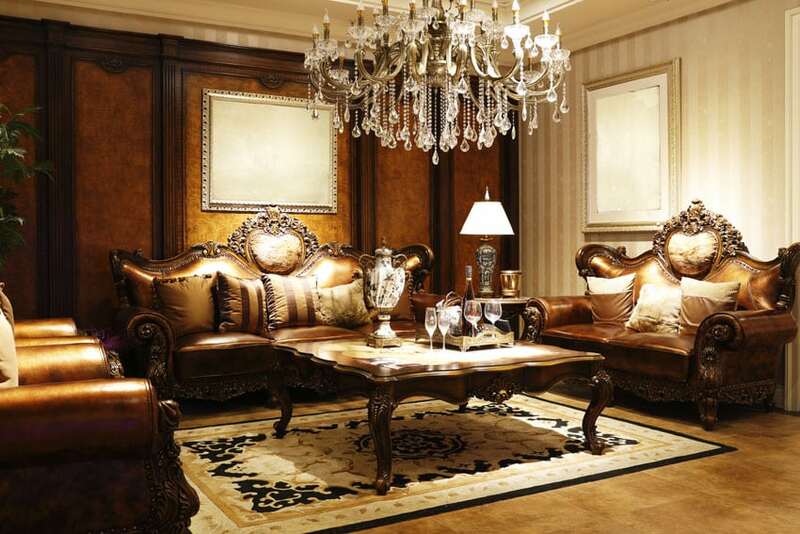 In the picture above a traditional crystal chandelier is perfect for this large, luxurious formal living room design. Combine them equally with ornate ceiling details such as coffered panels, ornate corning, and raised ceilings for a compound stylish effect. Chandelier lights are plenty efficient when it comes to lighting up a living room, but its functionality mostly comes second to its main draw – its aesthetic value. Known to be quite a status symbol and design accent for any interior space, chandeliers come in many variations. 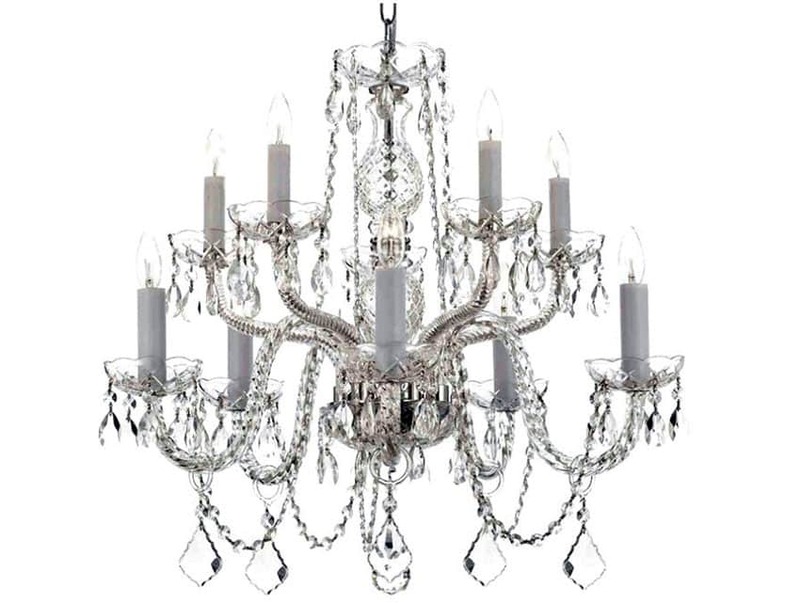 There are globe chandeliers, linear chandeliers, drum chandeliers, and the ever popular crystal chandeliers. The materials used to create globe chandeliers can vary from copper to wood and from glass to steel. When it comes to design styles, chandeliers can come in more traditional forms as well as more modern, contemporary ones. 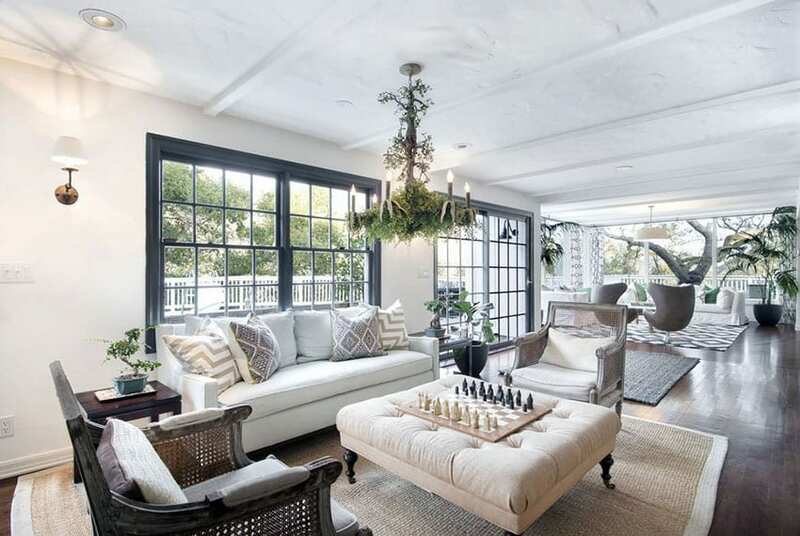 The sky’s the limit for this ceiling-decorating design element. There are a few considerations when deciding to use a chandelier for your living space. First off is the size. Figuring out how big a chandelier should be is a bit tricky. Aside from the logistics of it all, you also have to be sure that the size isn’t so small that it doesn’t add much value to the space or too large that it overpowers the design. A good metric to use is the size of your living room in feet. Take the sum of those dimensions and convert them to inches – that should be a good measure of how wide your chandelier can be. A 10’ x 10’ square living room, for example, can accommodate a 20” wide chandelier. Secondly, we need to think about chandelier placement. Avoid being too close to any walls. Functionally, keeping light sources near walls wastes most of their lighting potential; the further away a light source is, the wider its through and larger its lit-up area. Also, needless to say, you don’t want your expensive piece of fancy lighting to hit or be hit by any tall furniture you might have in your living room. So try to keep it away from any tall bookshelves or cupboards as well. 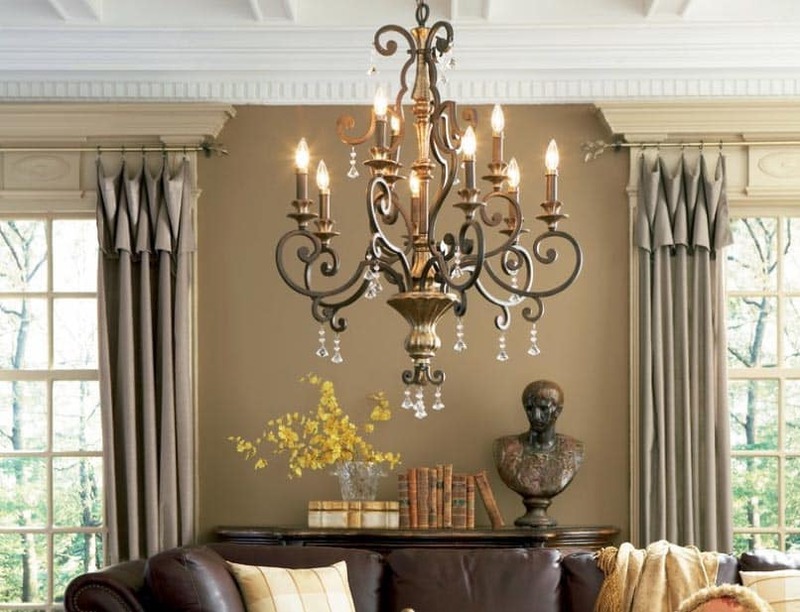 Be sure to choose chandelier variations that go with the overall look of the formal living room. For neutral, earthy aesthetics such as in this example, go for less gaudy, more subdued chandelier looks so as not to overpower the design. In most cases, chandeliers are best placed at the center of the living room ceiling. Functionally, this lets it light up the room better and aesthetically, it helps fill up the vertical space of the room and prevent it from feeling too plain. 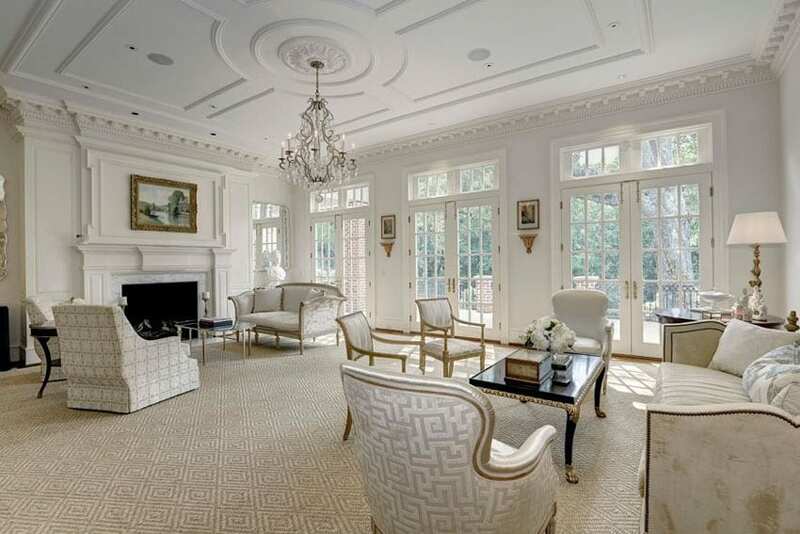 Who says only large, formal living rooms can utilize crystal chandeliers? Smaller living rooms can still take advantage of more ornate crystal chandelier designs by using smaller scale variations. 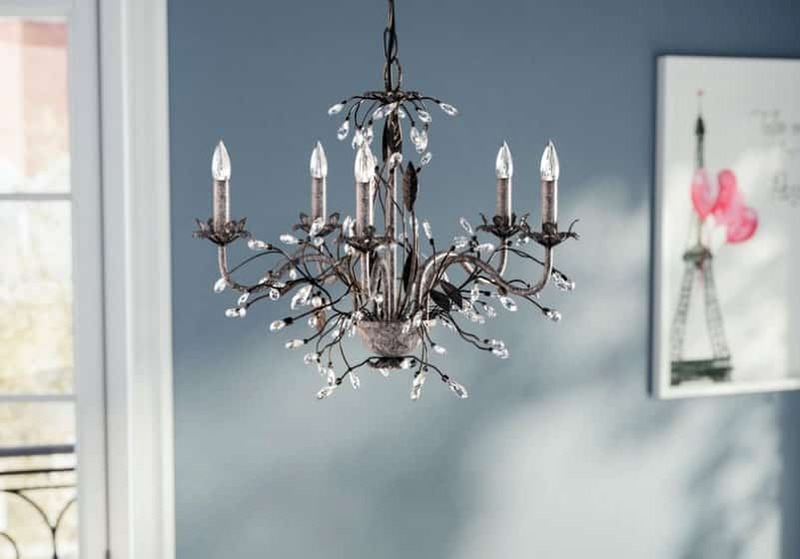 This beautiful French style chandelier is made with an antique silver leaf and imperial bronze finish. The chandelier offers 9 rustic candle lights and multi-faceted crystal droplets. This contemporary living room features an interesting chandelier that resembles the branches from a tree with interwoven lights throughout. The custom ceiling feature provides added depth with its curvature shapes within a round design. 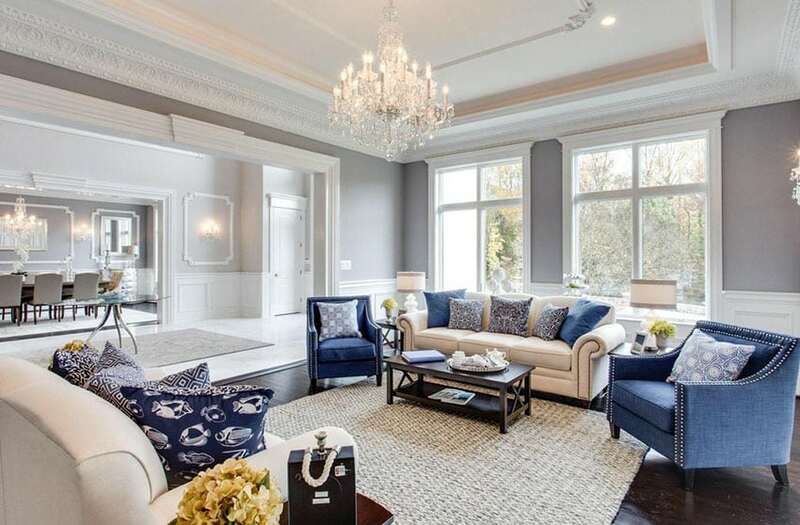 This couchless living room creates a grand impression with its large glass chandelier. More glass droplets can create an almost glittering, shimmering effect for your living room chandelier. When used effectively, it can greatly enhance your living room experience, especially at night. Lower set chandeliers can be used in more intimate, low-ceiling spaces such as this one. 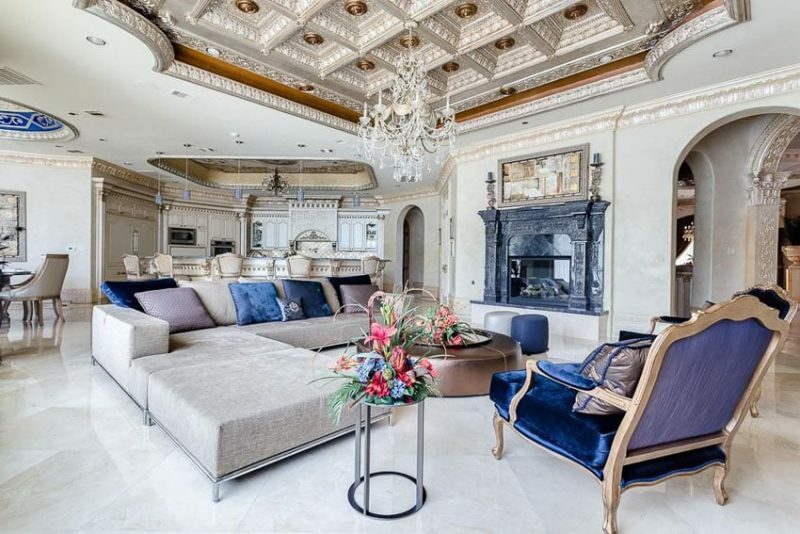 You won’t have to worry about the chandeliers hitting anyone’s head when it’s placed directly above a coffee table or some other piece of accent furniture. 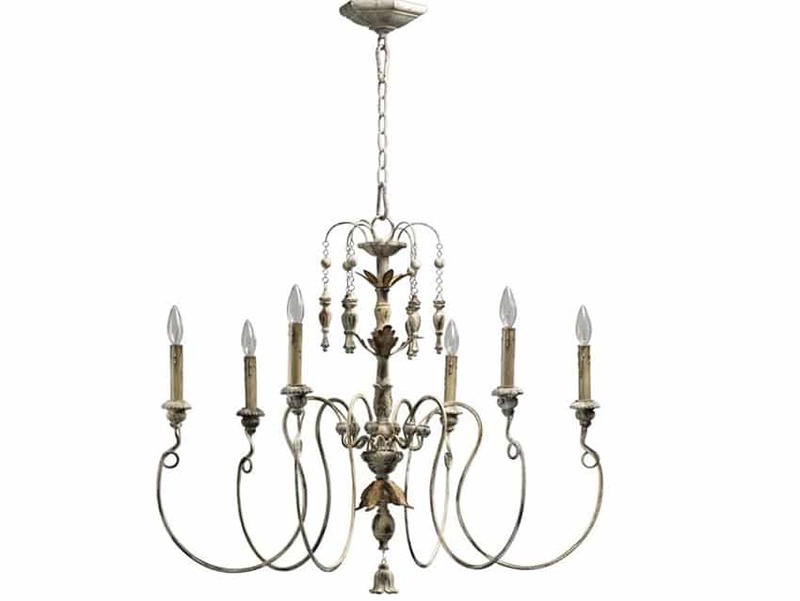 This candle chandelier employs a candelabra design and holds six candle-esque bulb holders and a shape steel form reminiscent of traditional wrought-iron chandeliers used in formal living rooms of the Victorian era. More modern living room designs also call for more contemporary chandelier looks. 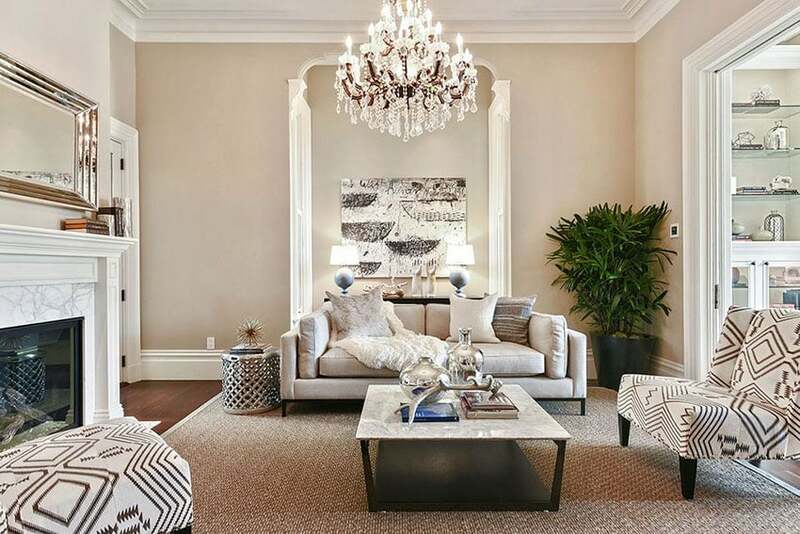 Crystal chandeliers can be done in more minimalist, sleek, modern ways like the one used in this chic living room space. The type of light bulbs you use for your living room chandelier can also have a large effect on how it adds to the space. Choose bright, daylight light bulbs if you’re looking to really light up the room and warmer, soft white light bulbs to give you room some quiet ambiance. This 10-light crystal chandelier employs light bulb holders that almost look like actual gray wax candles. Its design employs beautiful strings of reflective glass droplets and chrome arms that bounce off light. This modern art deco style room showcases a deep gray theme with gray paint, curtains, floor tiles, furniture and decor. With a gray theme lighting is imperative to ensure the ambiance isn’t too dark. 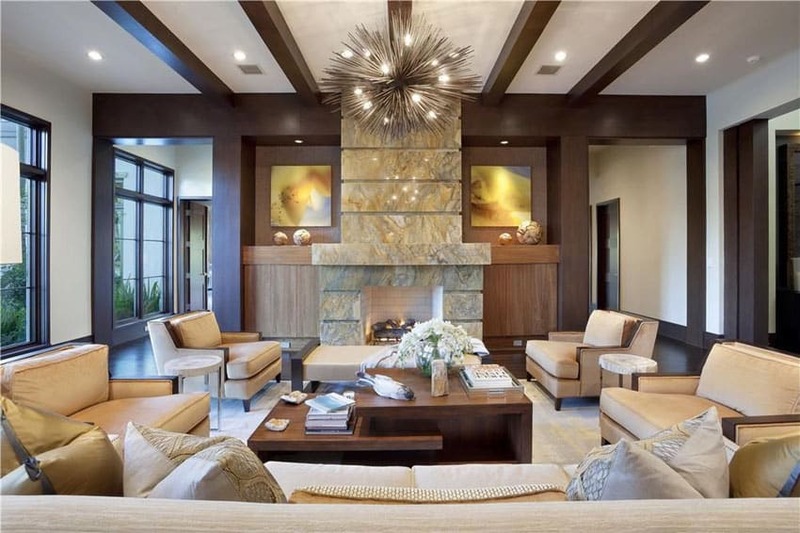 A large modern chandelier with an assortment of lights offers plenty of illumination and is complimented by a similar lighting fixture in the adjacent sitting room. If traditional, classic glass chandelier designs are a bit too cliche for you, there are tons of variations on the concept that might appeal. Check out this artistic take on the crystal chandelier that’s reminiscent on beautiful plant-life. 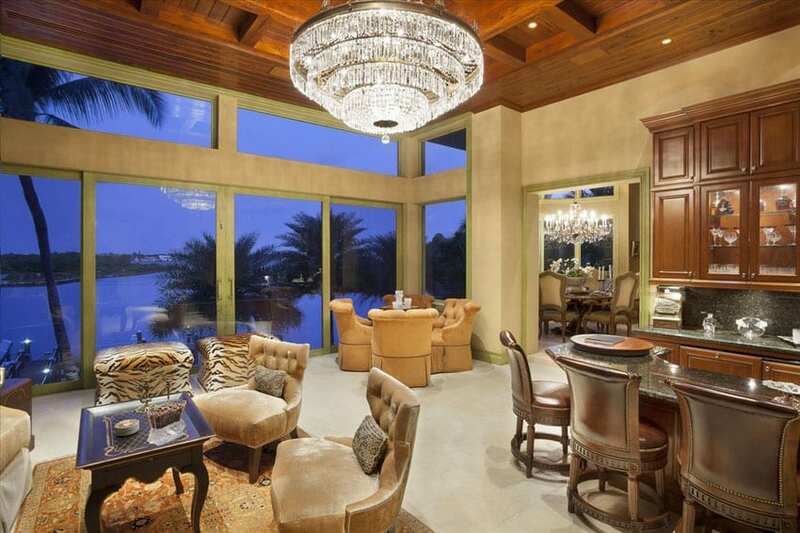 When it comes to chandeliers and lighting design, there are endless possibilities. When it comes to the type of chandeliers that truly complement your space, only your imagination is the limit. This modern pointed chandelier definitely makes a big impression in this contemporary living room space. The chandeliers brown tones compliment the wood beam ceiling and wood finishes of the walls and window molding along with the wood accents of the furniture. Visit our gallery of bathrooms with chandelier lights for more interior design ideas for your home.